Kei Nishikori felt like he was playing on "one leg" as his marathon Australian Open exploits played a big part in his retirement during a quarter-final against Novak Djokovic. The eighth seed lost the first set 6-1 and was trailing 4-1 in the second when he cut short the last-eight match on Rod Laver Arena on Wednesday. Nishikori received treatment on his right quad after a first set in which he was clearly not moving freely. The Japanese world number nine came through three five-set contests to reach the last eight and fought back from two sets down for the second time in the tournament to beat Pablo Carreno Busta in a thriller on Monday. 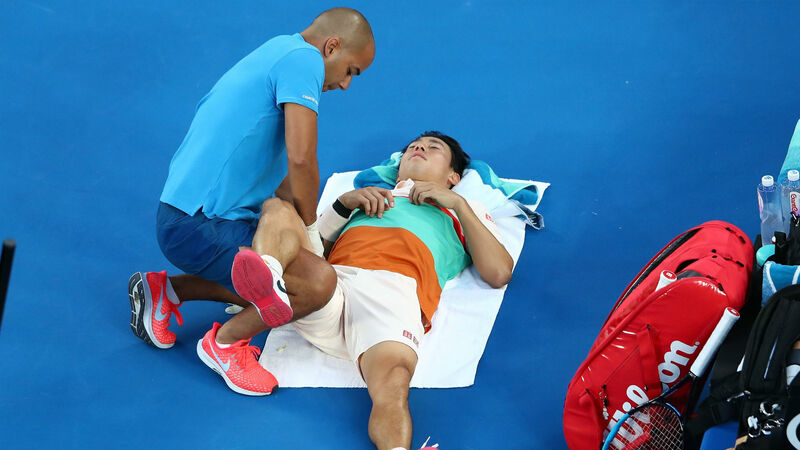 Nishikori revealed he had not felt the injury before facing the world number one, but explained spending so much time on court at Melbourne Park took its toll. He said: "Before the match, I was okay. Of course, I wasn't, like, fresh, fresh. I thought I was going to be okay. After the third game or fourth game when I was serving, I felt pretty heavy on my right leg. "After that I couldn't really bend my knees and couldn't jump up. I decided to stop." Nishikori added: "I'm sure it comes from my past matches, especially the last match. I was moving a lot, wasted too much energy. It could be from that and also, something happened today during the match. "So I'm disappointed. It's tough to lose like this, but I try to keep my head up." Nishikori stated that the fact he was facing the top seed did not have any bearing on his decision to retire. "I couldn't really move, couldn't hit my serve well. I don't think even if it's Novak, I couldn't beat anybody with my one leg. It was just too tough." he said.